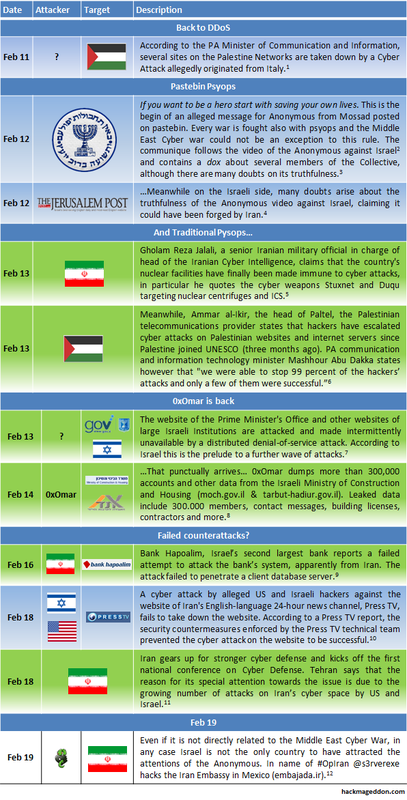 Click here for the Middle East Cyber War Master Index with the Complete Timeline. This week of Cyber War on the Middle East front, has shown a slight change on the Cyber Conflict trend. For the first time since January, psyops have deserved a primary role, maybe on the wake of the video released by the Anonymous against Israel one week ago. Not only the Jerusalem Post calls the video into question, but also argues that it may have been forged by Iran, identifying a state sponsored impersonation behind the entry of Anonymous in this cyber war. But this has not been the only psyops event as an alleged message from Mossad to the Anonymous has appeared on pastebin, whose beginning sounds like a dark warning: If you want to be a hero start with saving your own lives. Although there are many doubts on its truthfulness, it deserves a particular attention since outlines a new age on psyops, what I call “pastebin psyops”. But a war is not made only of psyops, so this week has also seen more hostile actions, among which the most remarkable one has been the leak of 300,000 accounts from Israeli Ministry of Construction and Housing. This action had been preannounced by a wave of attacks on primary Israeli sites (which targeted also the PM site), and most of all, has been carried on by 0xOmar, the absolute initiator of this cyber conflict. Palestine has been targeted as well, and it is really interesting to read under this perspective a statement by Ammar al-Ikir, the head of Paltel, the Palestinian telecommunications provider according to whom cyber attacks on Palestinian websites and internet servers have escalated since Palestine joined UNESCO. On the Iranian front chronicle report of a failed cyber attacks againstPress TV, Iran’s English-language 24-hour news channel and most of all of a controversial statement by Gholam Reza Jalali, a senior Iranian military official in charge of head of the Iranian Cyber Intelligence, according to whom the country’s nuclear facilities have finally been made immune to cyber attacks. And it is not a coincidence that in this week Iran has kicked off the first national conference on Cyber Defense. A matter that deserves a special attention by Tehran because of the growing number of attacks on Iran’s cyber space by US and Israel. On the other hand, Israel did a similar move one month ago, at very early stage of the cyber conflict.